I’m sorry for being that person, but how are we already nearing the end of January? It feels like it was only last week that I was securing Mike’s Heisenberg bobble head to the top of our Christmas tree. Now here I am in the last week of January brainstorming Super Bowl and Valentine’s Day recipes. What gives?? 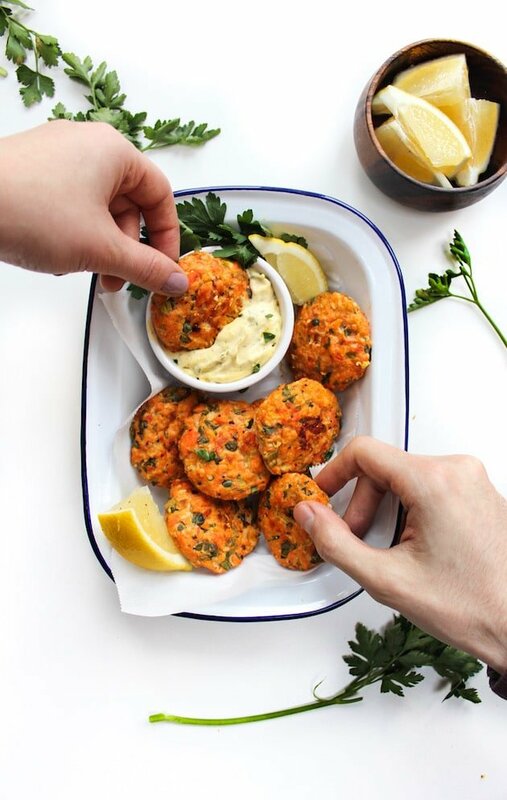 But more on those recipes next week because I’m all about this mini paleo salmon cakes today! I even made a lemony herb aioli to go along with it because what are fingers foods without some sort of dipping sauce, am I right? First things first – the salmon. You can used fresh or canned salmon depending on which you prefer. For the ones pictured here, I used fresh fillets I bought on sale that needed using quickly. If you do decide to use fresh salmon, make sure that you weigh the fish after you cook it since fish loses moisture during the cooking process. Otherwise, canned salmon is still totally fine! They usually come in 6 oz sizes which is easy enough for this recipe. The potatoes are also adjustable depending on what you want/have ready. I use mashed sweet potatoes here but feel free to go a more traditional route and use white potatoes instead if you’d prefer. If you’re looking for a low FODMAP recipe, there are a few of things you can adapt to make this recipe work for you. The salmon cakes are easy enough to work around. The only thing to keep in mind is to only use the green parts of the spring onions. As for the aioli, I recommend using garlic infused olive oil so that you can still get the garlicky taste. The garlic flavour won’t be as potent as a more traditional aioli but you still get the flavors without all the stomach issues later. Sweet potato is something that can be considered high in FODMAPs, but under 1/2 cup is considered ok. This recipe only calls for 1/4 cup so we’re well under the limit here. Eat these on their own with the lemony aioli or throw a few on top of your favourite side salad. You can form larger patties if you’re in the mood for more of salmon burger. I may be biased but I think this aioli would make a really ace burger spread. Don’t forget to #asaucykitchen on instagram if you make these paleo salmon cakes. We love seeing what you make! You can also post your pictures to our facebook page! In a large mixing bowl, add all of the salmon cake ingredients. Mix everything together with a fork util combined. Form mini patties, about 3 inches in diameter and place on the baking tray. Bake for 25-30 minutes or until firm and browned on the sides. Make sure to flip the patties over in the oven halfway through cook time. While the salmon cakes are baking make the aioli. The easiest way to make this is with an immersion blender but you can also make this in a food processor, blender, or using an electric mixer. Place the egg yolk, 1/2 of the lemon juice, and mustard in a small bowl or blender/processor. Start whisking/blending everything together until the mixture thickens. Then gradually pour in the olive oil. It's important to add the oil slowly because adding too much too soon will result in a runny or cuddled aioli. As the mixture thickens, add more oil until you have a thick, creamy mayo. Add the remaining lemon juice along with the garlic, parsley, and dill and mix in by hand. Taste and season with salt if needed. Transfer the aioli to a small bowl and serve with the salmon cakes. Store left overs in an airtight container in the fridge for up to a week. If you don't have any mashed potatoes on hand you can make it easily by peeling and chopping 1 large potato (white or sweet) and placing the chopped pieces in a small pan. Cover the potatoes in 1 inch of water and bring to a boil on a high heat. Reduce the temperature and cover. Let heat for 15 minutes of until you can easily pierce the potatoes with a fork. Drain the potatoes and place in bowl. Mash with a fork until no lumps remain. 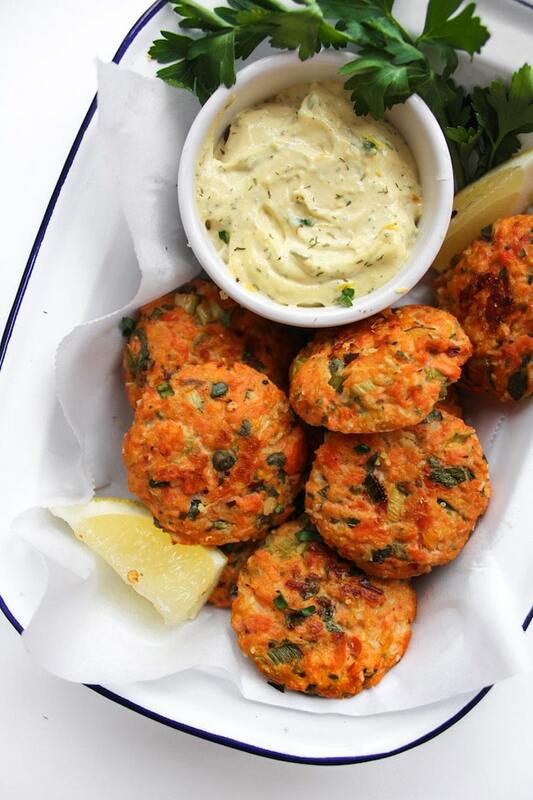 I am very interested in making these salmon cakes! I was wondering what you meant by cooked salmon flakes though. I am new to cooking so this may be a stupid question, but do you mean that I should cook my salmon filet first and then chop it up to make it flakey? Or did you have another method in mind? Hi Hanna! That’s not a stupid question at all and you are exactly right! You can either cook a salmon fillet and chop it up – once it’s cooked it kind of shreds apart pretty easily or use cooked salmon from a can. Hope that helps! Thanks so much! Excited to make it this week! What is the serving size, how many patties? Thank you!! Made these tonight for a friend just starting a low fodmap diet and they were perfect! This is def a keeper, thank you! So glad you guys liked them! Thanks for coming back to let me know what you thought! 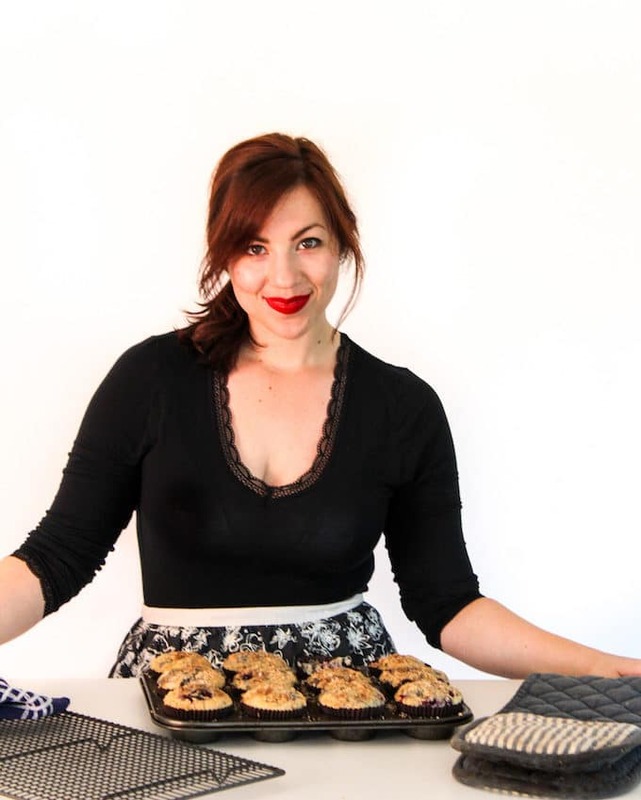 Hi Laura – they’re baked in the oven! These were delicious! Thanks for this recipe. These are awesome!! Made enough to freeze for lunches. Thanks! j’aimerais réaliser cette recette mais pouvez-vous me donner un plus de précision. pour les pomme de terre blanche ? ou patate douce ? et le poids. quant au saumon combien de darne ou le poids s’il vous plait. 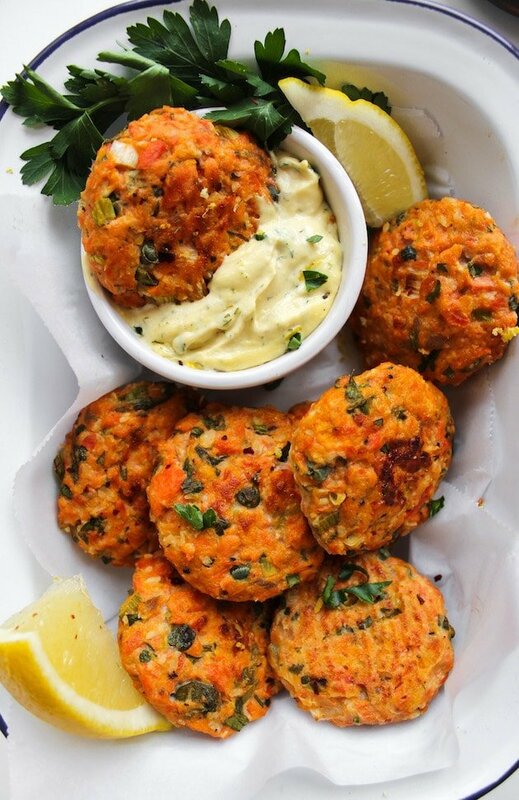 I’m a crab-cake lover, so I’m sure I’d LOVE these salmon cakes as well! I love that I am also able to use canned salmon in place of the filets for convenience. Do you think I could make them bigger, like 5-6 patties instead of 10-12?